Inside Tennis, which is now in its 37th year, is published seven times a year and reaches over 300,000 readers. We are mailed to the homes of members of the USTA in Northern California, Southern California, Nevada and Texas and distributed to fine tennis and country clubs, pro shops and sporting goods stores. Many of our issues have bonus circulation at tournaments such as the US Open in New York and the BNP Paribas Open in Indian Wells. For information about rates or potential advertising, please call (510) 665-9600 or email simons@insidetennis.com. Receiving my monthly issue is the highlight of the month. Well-written with opinion – which some tennis publications lack. You produce the best tennis publication in the world … IT always has inside information that appears in no other publication. I had to tear the Yearbook away from my son, who was reading it under the covers at 11 at night! The magazine’s format is ideally suited to our needs and allows us an excellent mouthpiece … to reach both our members and the tennis-playing public in general. This publication has made a significant impact on tennis. It has generated enormous enthusiasm and has given us at the USTA NorCal an arena to promote our programs. There is a fight in the Bryan household over who gets to read it first. I’ve never read a better, more probing, honest, reflective and witty series of articles, letters and insights than this past year in Inside Tennis. And I have been playing, coaching and reading about tennis for 50 years. So thank you for the last 30 years of stories, lessons and insights. After the Bible, Inside Tennis is my favorite read. Everyone in the country picks up Inside Tennis to see if his or her name is in there. I enjoy your magazine tremendously. I look forward to receiving it every month. It’s one of the reasons why I maintain my USTA membership. Our members look forward to Inside Tennis. It really helps tennis. You are still far and above the trash of the slicks and you produce more real, well-written and interesting news in one issue than Tennis does in a year. No doubt about it. One of your gifts is stimulating interest in tennis and helping it grow in a tough time. Receiving my monthly issue is the highlight of the month. Well-written with opinion–which some tennis publications lack. I had to tear The Yearbook away from my son, who was reading it under the covers at 11:00 at night! I’ve read all the tennis writers, including Sports Illustrated’s Frank Deford, and nobody touches what you do. Your ability to write about different players is extraordinary. The Agassi piece is the best tennis article I’ve ever read. Your summary of his book was perfect. You translated his circumstances with meaningful, understanding prose that went beyond sports. Nobody gets to the heart of people the way you do. Your magazine is just the best there is. 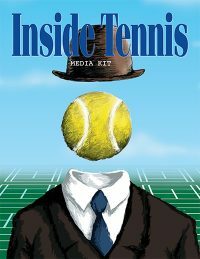 Inside Tennis is the best tennis publication available – nationwide. You guys nail it every time with insight, humor, knowledge, honesty and style. It may be the best in sports overall. What a fantastic issue! God, I couldn’t believe it. Nelson Mandela and Maureen Connolly all in the same issue! You far outshine Tennis magazine. This comes from a journalist and PR pro. We all know about Mandela’s imprisonment, but I never knew about his tennis connection. And what Andre, Johnny Mac and Serena had to say – very eloquent. Inside Tennis gets me re-fired up each and every month. I really enjoyed the write-up on Mandela in the last issue. Uplifting articles like that help all humanity. Just read (through moist eyes by the last paragraph) the article on Maureen “Little Mo” Connolly. I thoroughly enjoyed the piece on Little Mo, but the tribute to Mandela was exceptional!! It’s unbelievable how much better Inside Tennis is than the other magazines out there. Yours is the Bible. IT gets people talking. Your magazine is a treasure to American tennis. You’ve got to read Inside Tennis. There’s all kinds of stuff in there you don’t see anywhere else. I have your recent publication with Billie Jean and I am making it mandatory reading for all my female students. Thanks again for a great mag. I am 16 and am simply enticed by every issue Inside Tennis publishes. My husband and I love it. It’s so readable, so juicy. It’s gutsy and written in a way that speaks right to you. It’s a style I don’t see anywhere else. Inside Tennis is far and away the most useful publication on tennis that I’ve ever read … You’re making the others look sick. I came home from six weeks out of town to a mailbox filled with 20 magazines: six Sports Illustrated, six Economist, two Inside Tennis, two Consumer Reports, Tennis, Via, Cal Sport, and AARP. Which did I read first? Inside Tennis, of course. Again Inside Tennis shows their creative writing talents. Not only was the article “They Did Their Best Work in Sneakers” well-written, but also, it had the human touch that the “who, what, where” articles seem to lack. Your article on Ashe and Mandela presents a dimension of that legacy about which I knew nothing. This is a real contribution to our national conversation on the intersection of race, sports, and politics. Inside Tennis is so awesome. It is all the things that Tennis magazine isn’t and should be. Thanks for all you do for the great game of tennis. You are a terrific writer and wonderful advocate of the game. Brilliant [Mandela] article! It’s so cool the way you tie it all together and educate the tennis populace about issues and history to expand their purview. I was tremendously moved by the article by Bill Simons about Nelson Mandela and his connection with tennis through the years. It was especially poignant as I read the article today, on the 50th anniversary of Martin Luther King’s pivotal speech. Thank you for reminding all of your readers about the importance of our personal interactions; healthy competition; and the true gift of forgiveness. This was a truly inspirational piece of writing! Terrific piece on Mandela by prolific Bill Simons in @InsideTennis. Great quotes from players who met him, too. The ad worked out great. We got calls from all over. Inside Tennis is just the right advertising vehicle for us. Your magazine is really the only one I read. You guys are the best. You do a great job with college tennis – you do a great job, period. I’m a big fan. There is something unique about your magazine that we all come to eagerly await, getting your skinny on the guys and dolls in tennis as each issue is dropped into our mailboxes. Bill Simons is a beautiful writer. I read his articles over and over, wondering if, besides being a writer, he’s also a doctor of learning, perhaps a psychiatrist. We really appreciate all the hard work you all put into the publication – many inspiring stories for the kids. Thank you for producing Inside Tennis for avid tennis nuts like my husband and myself. We devour every word. When I read your writing, all the problems and petty stuff in tennis that sometimes seem so important goes away. I enjoy reading Inside Tennis so much, and the principles you stick up for. Inside Tennis should get some kind of medal for their work. It’s rich in player interviews, personality studies, and big tournament coverage … and it’s a pleasure to read. I enjoy reading Inside Tennis very much. It’s one of the only publications that I read cover-to-cover, and I subscribe to many, ranging in subjects from tennis to independent film. My family absolutely loves Inside Tennis. When a new issue comes out, we fight over it. We actually spend more time reading Inside Tennis than all our other sports magazines combined. My wife and I so look forward to each issue of IT. After reading it, I pass it along to my friends, who say it’s the best tennis mag they’ve seen. Over the last few years, Inside Tennis has quietly become the most interesting and readable tennis publication around, due in large part to its characteristic, bemused intelligence. My husband and I love IT. It’s so readable, so juicy; it’s gutsy and written in a way that speaks right to you. It’s a style that I don’t see anywhere. IT, you’re killing the entire tennis industry by not going out to the entire nation. It’s unbelievable how much better you are than the other magazines out there. I fall asleep when I read most other magazines, but yours just rocks … those other magazines are a joke. Everybody who comes into my shop reads IT and an hour later, they are still reading it. I see everybody reading it. All the others are filled with fluff, yours has so much substance: Yours is the Bible. IT gets people talking about ideas and quotes and quoting stats. The best gift you could give the tennis industry would be to have your magazine read by everyone across the nation. I subscribe to every tennis magazine and yours is the best by far. Your sensitive interviews are fantastic. Your covers are real show-stoppers. Everybody likes Inside Tennis. All my members take one when they go home. Everybody’s reading it. Every time I get mentioned I get a lot of recognition. One of the things that Northern California has that makes it special, that other regions just don’t, is Inside Tennis. It’s great for the game. The national magazines just can’t do that. At the Wimbledon final, there were the two best players of all on the greatest court of all time, and it was covered by the greatest tennis magazine of all time. That combination was perfect. Inside Tennis is one of the things this section has that makes it special. It helps more than anything we do. In the Midwest, where I come from, we had Centre Court magazine but people didn’t pay attention to it at all. What you do is exceptional. It facilitates so much that we do. I consider you a champion of the sport. You clearly are devoted. Bill Simons is the best writer of all time. He’s done such a creative job at creating his craft. The more that people read it, the more they get enthused and want to play. It’s good for tennis as a whole. Despite my admiration for Chris Evert, I never read her magazine. I cannot tell you how much I enjoyed your recent IT coverage of Arthur Ashe’s legacy, Jeanne Ashe and the great Nelson Mandela. I even made my young daughter and nephew read the articles so that they, too, would be educated on our important icons of history. You do such a great job of keeping these topics relevant and in the forefront. Thank you for your vision! I have to say your issue with the Mandela piece, and also Little Mo, is great. Inside Tennis is simply more accessible and feels more “in the know” than Tennis magazine. It is more of a tennis player’s delight–and caring and also more creative. That’s my opinion and I’m sticking to it. The Ray Moore interview is terrific. I cannot imagine anyone else in tennis conducting and then publishing this sort of serious, in-depth and urgent piece. I know it’s often a struggle for you to keep up with your work and to keep Inside Tennis alive, but pieces like this are of the utmost importance to the game and serve as examples to the otherwise somnolent tennis press of what is possible. Your writing really is terrific. Very clever how you weave in the secondary themes. So much more fascinating than just hearing how the game went between the two players. You put others to shame. Your writing is so much more artful and complex. Inside Tennis is thoroughly informative, factual, imaginative and I feel that in many ways it outperforms others. Your writers are among the tops in their field. To have a periodical that embraces the international, national, and the sectional scene as well is extraordinary. Inside Tennis gives me faith that tennis is not dead yet, not by a long shot … Thanks for bringing it all together. Your magazine is amazing because it covers the news of legends, current and upcoming pros. Your articles contribute to a complex perspective of the sport itself. Thanks so much for sharing both stories, you really are such a gifted writer! While I had certainly heard of Gussy [Moran], you brought her to living color! I feel you are the conscience of the sport. You set the standard. Your review of Connors’ book got it exactly right. Incredible work. Really, really nice piece on Roddick. To be able to place his career, and his personality, in such a clear light on deadline is fantastic. So good going. Inside Tennis should get some kind of medal for their work. It’s rich in player interviews, personality studies and big tournament coverage … and it’s a pleasure to read. I have to say your issue with the Mandela piece, and also Little Mo, is great. Inside Tennis is simply more accessible and feels more “in the know” than Tennis magazine. It is more of a tennis player’s delight – and caring and also more creative. That’s my opinion and I’m sticking to it. I just wanted to tell you how much I enjoy reading Inside Tennis. You have a wonderful gift, writing brilliant articles with refreshing insights. I loved your year-in-review edition. Your magazine is par excellence, bar none. Your intuitiveness shines through and the depth in which you delve into emotions while bringing across your subjects’ feelings and personalities is quite perceptive, thought-provoking and, usually, inspiring. What makes Inside Tennis so special is that it intertwines tennis with so many facets of life. Your embracing of the many participants in this sport reaches into our spirits and souls. Kudos. In terms of creativity, no editorial staff I deal with comes close to yours. Your magazine is vastly superior … It’s interesting that a regional magazine is better than a national. I am writing to thank you and to celebrate all that entrepreneurs like Bill Simons bring to the game of tennis. Many of us take for granted that almost monthly we get the best coverage of everything tennis. Few know that without Bill’s blood, sweat and tears over the last 37 years, there would be no Inside Tennis. Every month he does whatever it takes to make sure this magazine works editorially, financially and for the families he employs. During this economic downturn, magazines and businesses are failing, yet somehow, Bill and his staff have always been able to make it happen. Like a Grand Slam champion, in many regards, he is out there on his own, grinding out match after match. For us readers, the magazine employees, and tennis in general, Bill Simons’ efforts have made a tremendous difference. Inside Tennis has become a staple in the tennis world, equal to those great names it has covered for decades: Sampras, Agassi, Inside Tennis. Bill Simons’ efforts to build, maintain and help Inside Tennis thrive have not only touched the lives of readers, USTA members and the industry as a whole, but most importantly, the staff and families which the magazine helps support. Inside Tennis is the only tennis publication that I read. Thank you for all that you do for tennis. Thank you so much for the “Roundtable.” I envy you, absolutely inspiring. As I read I could feel the passion, the emotions streaming from every response, interjections, every brief soliloquy – what a powerful interview you constructed. I’ve never run across a magazine that’s anywhere near as good. It’s really amazing. Everybody reads and loves it. You’re the only well-written magazine in tennis. I teach little kids. They look at it, and it got the kids at Cathedral High interested in tennis. What a great mag. I’ve never seen anything like it. I was glued to it for hours last night. You covered everything, I was stoked. We need publications like yours. What a great service. It’s the only news we get. Inside Tennis is the best thing that’s happened to Southern California tennis in 10 years. I’m always amazed by your coverage. Your reporters leave no stone unturned. What better regional publication is there than Inside Tennis? I was incredibly impressed with both the depth and refreshing candor of your coverage. Inside Tennis is what’s going to get news of our junior league program out. We really need coverage there to get it going. There’s no question about it, Inside Tennis is really The Bible for tennis out here in the West. Just wanted to drop a line to tell you how much I enjoy your magazine. It is such an improvement over Tennis Magazine.